Sad this site is indulging in quackery. Oh well. The entire point of this, the other thread, the conversation, and the independent testing is the application of scientific rigor to this device in order to falsify the associated claims and develop the theory. I can also be reached at "gary" (as above, replace admin with gary). We can accept targeted donations for our Exotic Propulsion Initiative. But any funds go into the fund for all "exotic propulsion" – not only one project. So other than what is described in the links below, is there any proof that plane waves can travel slower or faster than c in vacuum? This may or may not apply to what your asking but I found them interesting. http://arxiv.org/ftp/physics/papers/9911/9911062.pdf "THE LIGHT VELOCITY CASIMIR EFFECT", "Does the Velocity of Light in a Vacuum Increase When Propagating Between the Casimir Plates?" which suggest the speed of light may increase between the plates. I also found it interesting the same authors had a paper on the idea of the quantum vacuum falling near the earth to account for time dilation and gravity. http://arxiv.org/ftp/physics/papers/9902/9902029.pdf "DOES THE QUANTUM VACUUM FALL NEAR THE EARTH?" This paper above is what I suggested before that a sort of fluid was flowing into the earth and its resistance is where we get gravity from. It is also suggested motion of the fluid also gives time slowing effects (relativity). This is my first time seeing this paper but I am excited to find what I was thinking about. This idea of fluid time space I suspect may be linked to any propellantless drive that works (if we are pushing off it). It may also be linked to how large rotating black holes drag space time into a vortex around them. It also links the accelerating force felt in an accelerating rocket to the accelerating force of gravity. Still very much not proven. I don't think this proves it but it looks experimental. Making the vacuum devoid of energy, (wavelengths restricted from existing between the 2 plates) I would assume might change the vacuum dielectric constant to lower than one. Having an abundance of energy, giving a dielectric greater than one. Maybe similar to how light might slow down near large gravitational objects, though when measured inside the field it still appears, because of shrunken rulers, that light velocity is still the same. Another paper starting on page 14 that suggest super-luminal tunneling (http://arxiv.org/pdf/1008.1640v2.pdf). This one seems to deal with it specifically (http://arxiv.org/abs/0901.0508). Thanks for pointing out where the idea came from for the super luminal propagation between plates. Hmm, I suppose from the link you gave it suggests the effect is not measurable (change in velocity) which contrasts with the experimental claim of having measured super-luminal velocity. Interesting. I've been following this since New Scientist got in hot water for publishing an article on Shawyer's work back in 2006. It's exciting to see it has not been yet falsified. The debate and contributions in this thread remind me of the SpaceX video fixing effort; NSF is transcending the traditional role of forums and becoming some kind of collaborative knowledge creation nexus. Preamble over, I have a suggestion (and hopefully this makes it clear why this comment is here rather than in the article thread): There are lots of new posters who are bringing up problems which have already been addressed up thread. One of the problems of the linear thread style discussion is that it makes it difficult for people to see what has been done. The new article is a wonderful overview of the work, but I wonder if there's room for a page/article/site which lists possible sources of error/standard criticisms of the physical impossibility (maybe each as a linkable heading), and describes clearly what has been done to eliminate them from the system or accurately measure errors, and to theoretically address apparent contradictions to physical laws. I have in mind something like Grist's 'how to talk to a climate sceptic' (http://grist.org/series/skeptics/) where many common talking point issues with AGW are listed, and debunked. It could be useful if this list were editable like a wiki, so that when someone comes with a complaint already addressed, they can be directed to read that page in general, or linked to the explanation of their issue in particular, but also, if the suggestion is new, it can be easily added as an 'as yet un-eliminated issue' and can await further data. Maybe a flow diagram that can connect comments with in the thread. When you click a large thread the diagram is available. click a box and it takes you into another diagram of multiple comments that have been linked to that particular part of the flow diagram. It might make it easier to navigate and connect far spaced comments. One of the main criticism about the non-vacuum demonstrator that Shawyer build, to showoff one of his early EMdrive workings, was that - according to critics - some kind of hot air jet was leaking from non-welded micro openings at the large base of the frustum. 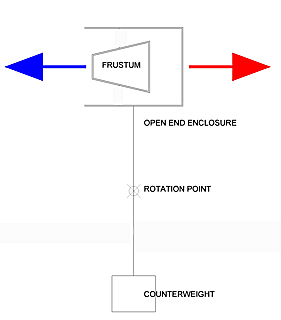 Countering that "hot air jet" criticism is fairly easy : just build an open enclosure that, in case of a leakage jet , would generate an opposing reaction force to the direction the frustum is supposed to go. In all honesty, a simple well taped cardboard enclosure would be enough, just to redirect the supposedly reactionary "exhaust" forces... Of course , testing with and without enclosure is a must, for reference. This upcoming test in June will be a real "make or brake" event. No more endless discussions about measurement procedures and potential measurement errors. I'm sooo in anticipation modus now.. All it needs to do is...TURN in the right direction. Contra the usual popularisations, Special Relativity doesn't remove the possibility of a preferred reference frame for the Universe, it just makes it very hard to observe. An alternative, being explored, is Lorentzian relativity, which experimentally gives much the same results as SR, but an absolute frame is preserved. This makes 'accounting' for one object's energy relative to another quite straightforward. These thrusters might provide one means of experimentally determining which version of Relativity is correct. We probably shouldn't speculate here though. I would prefer to hear the official answer. A bit of clarification: The Eagleworks crew hope to have the 1.2kW magnetron teeter-totter test-rig up and running by the END of June or perhaps now the first couple of weeks of July 2015. At the moment we are in the middle component procurement & fabrication, and that task is taking longer than expected due to mill breakdowns in the NASA fabrication shop and the usual supply vendor's taking their time to fill and ship orders. In reference to the item highlighted in blue above about phase shifting. It helps if you highlight the word phase in those two posts linked to below. So that's multiple sources supporting the importance of phase shifting and now a possible experimental verification. These are all looking at the group velocity, which is not necessarily the same as the signal propagation velocity. Not to this level of precision and not without knowing material properties. Now if he also made the vacuum chamber in his wife's dining room, and took apart his microwave oven for the RF source, and been testing everything in his basement, there wouldn't be a problem here. Sorry, I would trust a shielding box much more than I would trust your calculations (when you are apparently unable to even get rid of the "thermal drift"). The pendulum arms are mechanically complex and made of materials that were never characterized with a necessary degree of precision. The cavity is made in a dining room, as you say. edit: and the springs that the pendulum is suspended on are getting heated up, no? Possibly by an electric current? Seriously? When it comes to energy (rather than momentum), there's always some people who got 1000W coming into a device, it makes 1010W heat, and you can plainly see that they aren't making the measurements to a necessary accuracy as to claim excess heat - they got various noise larger than their signal. Then they insist that they accounted for all the inaccuracies involving in the measurement of either.